This wheat flour halwa is great to taste and takes only few minutes to prepare. 1) Heat 5 tbsp of ghee in a non-stick pan. 2) Add a broken cashew nuts. Fry till golden brown.Take the fried cashew nuts to a bowl. 3) Add a cup of wheat flour in the remaining ghee. 4) Roast the wheat flour in ghee till nice aroma comes which takes around 8 minutes on medium heat.Keep stirring continuously while roasting otherwise it will burn.The color will also change to a little darker brown. Transfer the roasted wheat flour to a plate or bowl. 5) In the same pan ,add a cup of milk. Bring the milk to a boil. 6) Add a cup of sugar. Let it dissolve in the milk completely. 7) Now turn the heat to medium and add roasted wheat flour to boiling milk. Mix it in the milk continuously so that lumps are not formed. 8) Add remaining ghee to the flour when it starts to thicken. After it thickens and turn the heat off. 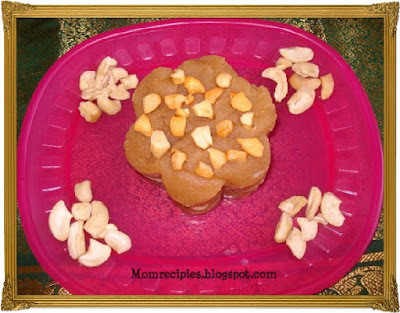 9) Garnish with fried cashew nuts. 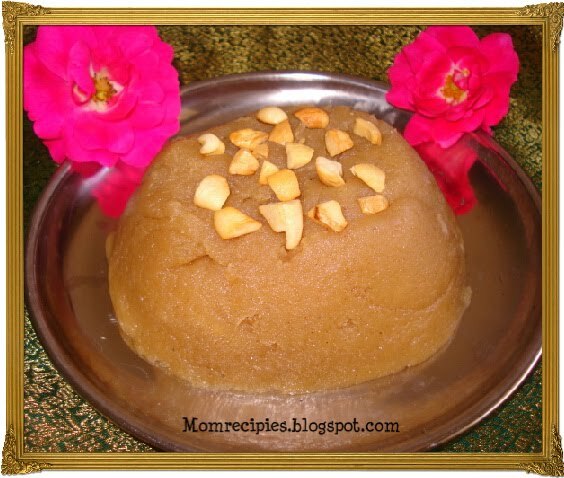 10) Transfer the halwa to a serving bowl and serve warm.